The most difficult task in designing SUB 1 and SUB 2 was not just to have these subs play lower and louder than any other subwoofers in the world, but to do so in a size that wouldn’t dominate the average living room, and in a cabinet that could be mistaken for a very fine piece of furniture. And then there are the mind-boggling specs. SUB 2 plumbs the depths to 7 Hz with bloodcurdling output: 112 dB at 10 Hz, 126 dB at 60 Hz (in room). Connected to a 240-volt line, SUB 2 delivers 4,500 watts of continuous RMS Sustained power and a Frankenstein 9,000 watts of Dynamic Peak power through its unique Power Factor Correction system. Talk about bringing your music and movies to life! SUB 1 is no slouch either, delivering 1,700 watts of continuous power and 3,400 watts at peak. Typically, subwoofer enclosures contain one large driver. As that driver moves back and forth, the cabinet can vibrate which leads to smeared response, bass that lacks clarity and definition. Well-executed cabinet design, like that on Paradigm Reference subwoofers, typically includes sophisticated and extensive physical bracing inside the enclosure. So why, when Paradigm puts six drivers in a single cabinet without significant physical bracing, does a martini set on top, while the subs are playing, barely elicit a ripple? Designed, engineered and manufactured by Paradigm in North America, SUB 1 and SUB 2 are movers, not shakers … massive air movement, massive output, virtually vibration-free. Six identical, perfectly balanced state-of-the-art drivers are radially aligned (two on each side) inside the cabinet. As opposing forces of equal magnitude, the powerful vibration-reaction forces (see the arrows in diagram, below) effectively cancel each other out. Barely a ripple disturbs the martini placed on top of the cabinet, such is the degree to which unwanted, distortion-inducing vibrations are reduced. Mineral-Filled Co-Polymer Polypropylene Cones. A 30% mineral content has introduced additional cone stiffness for a measurable increase in repeatability and consistency. Response is instantaneous—low, loud, fast and tight, unveiling layers and layers of low-frequency detail, with consistently perfect pace. Overmolded NLC™ Non-Limiting Corrugated TPE Surrounds and Nomex® Cloth Spiders. These extreme low-density NLC™ surrounds on SUB 1 were FEA-optimized and overmolded onto the cones in house. Ten times more effective than standard thermoplastic elastomers in damping vibrations and resonances, the corrugated material works in tandem with our Vibration-Canceling Design Architecture to ensure not a hint of distortion exists, even at peak-to-peak excursion (almost 2″ / 50 mm in SUB 2!) and full-on output. RCR™ Resonance Control Ribs. NLC™ surround technology was not required in SUB 2 since the six 10″ drivers already allow for larger surrounds. The cones’ resonance control ribbing simply reinforces the new VC design architecture. As in SUB 1 cone excursion on each driver is extreme. Magnetic Pole Piece. FEA-optimized, tooled to support the extreme excursion. High-Pressure Die-Cast Aluminum Chassis with AVS™ Airflow Ventilation System Cooling. Large built-in ribs increase the heat dissipation surface providing forced-air cooling during large musical transients and chassis convection cooling at all other times. CNC-machined to ensure a precision fit. 3″ (76 mm) 10-Layer Long-Travel Aluminum Voice Coils. Wound on high-temperature composite polyamide formers in an oversize configuration, the coils provide exceptional stability and support for the extremely high cone excursion. Extruded Aluminum Center Heatsink. Provides internal convection and forced-air cooling to wick heat away from the high-velocity low-turbulence pole piece, increasing power handling and reducing distortion. Computer-Optimized Ceramic (Hard Ferrite) Magnet Assemblies with Balanced Field Geometry. 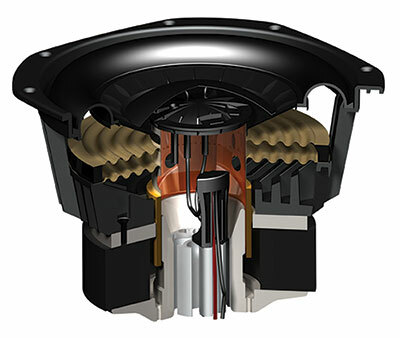 Using Finite Element Analysis, the magnet structures were optimized to yield the most powerful output in a Signature subwoofer to date. Transient and phase-response are exceptional with superb power handling and output linearity. 3-Kilowatt Amplifier Platform. 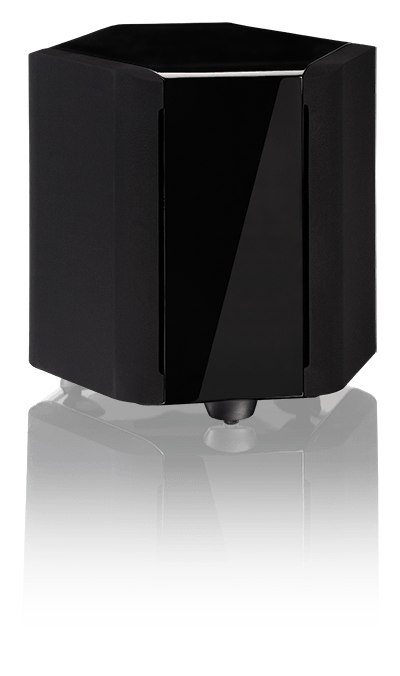 Designed, engineered and manufactured by Paradigm in North America, the SUB 2’s state-of-the-art Ultra-Class-D™ amplifier design premiered to rave reviews and great success in the Signature SUB 25. Motivated by their success, our engineers went back to work, tweaking, testing and modifying the ampifier’s circuit board and software. The result is the most powerful subwoofer amplifier we (or anyone else for that matter) have ever produced. We call it the “Kilomax” design because when connected to a 240-volt line, it delivers a monster 4,500 watts of RMS Continuous power and a Frankenstein 9,000 watts of Dynamic Peak power. No Power Transformer. The output stage is Direct-Connected™ to the power line to provide maximum power. Advanced Output Stage. Increases switching speed and efficiency. Unlike conventional Class-D designs which use the slow built-in diodes of the output MOSFETS, our Ultra-Class-D™ design steers circulating currents to ultra-fast diodes (ten times faster!). Opto-Coupled Inputs. Offer better isolation and lower noise. Short-Circuit Protection. Reacts within 10 μs. Design Hexagonal cabinet with multiple high-excursion drivers radially aligned in a Vibration-Canceling Design Architecture, patented built-in Ultra-Class-D™ power amplifier with Power Factor Correction, sealed enclosure, PBK interface. NOTE: Due to the incredibly high power and tremendous output the SUB 2’s grilles are non-removable.